If you’ve ever loved an animal, today is one of those days that is the hardest. The day when after years of love, hugs, and kisses you have to say goodbye. You know it’s time. You know it’s the right thing to do. But as the tears stream down your face, your heart breaks, and a little piece of you goes silent. Today was that day for our sweet Abby, our pretty girl. 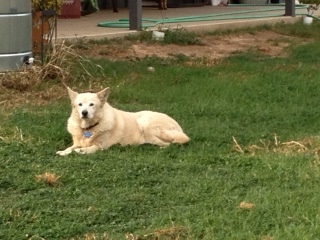 Abby was 13 1/2 years old, and the oldest of our canine crew. Truth be told, she was the last one of our original family of five dogs, so it felt in some ways like the end of an era. We’ve known for some time that Abby’s time with us was coming to close, but this weekend it became clear that she was ready to move on. A beautiful blond Shepard mix, Abby had dropped to under 30 pounds, just a shadow of her former self. This morning I made the call to our vet, and through tears choked out that it was time to say goodbye. As always, he took fabulous care of us and fit us right in. Cowboy and I stayed by her side until the end. Tears rolling down our faces, holding each other, and whispering to sweet Abby that it was okay. She would soon be at peace and all of her friends who have gone on before her, like her best pal Pooh Bear, would be waiting to greet her. As we said our goodbyes, we left with love in our hearts and her worn leather collar in our hands. One more of our fur-children gone from this world. No matter how many times we go through this, it never gets easier. Our sweet Abby. You taught us so much. Rest in peace pretty girl. Once we got her home, she didn’t so much trust people at first, given what the two-leggeds had put her through, but she loved our other pups, especially Pooh Bear. Abby lived under the futon until we she was too big to fit, and to this day hid her head under furniture when she was scared. But even given her unfair start in this world, Abby was a sweet loving girl. She gave back so very much. She was simply the best. Here’s what we remember most about our Abs. We laughed when at about six months old her ears went from flopping at the top to standing straight up. I can still see her turning her head with that questioning look and those great big ears. We’ll never forget the day she found a blue gel pen and chewed it to pieces turning herself and our comforter bright blue. It was like our very own Braveheart. We always said Abby could spot a lawyer. The only time she ever bit anyone was our neighbor and dear friend, the lawyer. Luckily he had done the reaching at her, had on gloves, and most of all had a great sense of humor. She was never one to snuggle up to you, but she loved to be petted, and the porch was her favorite spot. I’d sit in the big wicker chair and she would back into me over and over for a good rump scratching. She was a lesson in love, as she and Pooh Bear would always lay together, licking each other’s faces. They were never very far apart. In retrospect, after we lost Pooh Bear she never really was quite the same. So as our hearts ache tonight, we want to remember the good times. That we gave her that second chance that she needed. That she gave us so much more in return. Rest in peace pretty girl. Cover Pooh Bear in kisses and snuggle with your long lost pal. Until we meet again. P.S. Again, I have to say big thanks to our wonderful veterinary staff who was just as compassionate as they could be, and I could see in our vet’s eye how this is the hardest part of his job. We are so grateful to have you caring for our fur-kids. Dad: Pete and Repeat sitting on the fence. Pete fell off and who was left? You can imagine the little girl giggles this created, as this could go on and on. But the reason it’s been on my mind lately is that I think it is the perfect description of the crazy Texas weather and the farm antics that ensue when we are frozen in. Just a few short winters ago we were stuck in the snow in a major way, at least for Texas. This winter we were iced in yet again, and let’s just be honest here, winter is certainly not over. While I have still not mastered the ability to be graceful on ice, and my hopes for this are waning each year, the farm chores still have to get done. As Sweet Suzy Q will tell you, it might be cold and she may have fresh hay, but she is most definitely positive that she still needs to have her feed twice a day or she very well may wilt. I’m happy to report that with each winter here at the farm, Cowboy and I learn something new and feel like we make little improvements. For example the mud boots required for this weather are in place and in multiples! The big “yehaw” this year is that we (and by we I mean Cowboy) were able to install underground waterlines to all of the stalls. This means we were not dealing with miles of frozen hose. Can I get an amen! We did still have some frozen spigots and at times were relegated to one water trough, but everyone had access and we were able to keep it refreshed and heated for all our equine kids. It’s a slippery drive to the barn. It might look like snow but it’s a solid sheet of ice. The canine kids investigate the ice. Check out Maybelle’s ears. The horses are investigating their round bale and jockeying for the best munching position. What do we still need to work on? Well there was the matter of the ice on the roof shifting and ripping loose the gutters, which resulted in me skittering outside across the ice only to shuffle back inside and tell Cowboy, “I think we have a problem.” Cowboy investigated and concurred, always frightening since I’m the worrier. After bracing things with the tractor, shoveling, heating, and fiddling, he had us back in business. Thank goodness Cowboy is so handy, or I’m not sure how this farmtastic life would work. So bring it on winter. Pete and Repeat sitting on the fence. Pete fell off and who was left? P.S. Cowboy and I have a dream that one winter we will have it all nailed down before hand. I’m not so sure that will happen, but we are giving it one farmtastic try. As I’ve mentioned before, Cowboy and I both have day jobs in order to support life on the farm. My job happens to be in the high-tech industry, which can be exciting but also volatile. This has been an especially rough week for me as my company is laying folks off (or as the latest industry trend likes to call it “delayering,” but this farmgirl says let’s just call a spade a spade). While I am super blessed to have landed a spot, many great folks, some dear friends of mine, were ushered out the virtual door. It’s truly been heartbreaking. Currently, I product manage software applications for the digital industry. It’s a fast moving place where things are always changing and there is never a shortage of things to learn and do. Simply put, it can be thrilling and an adrenaline rush when you see your ideas comes to life. But to be honest, I’m a bit of an oddball in the field as I live in rural America and do this job remotely. Many of my colleagues are big city folks who are immersed in technology 24/7. But while I’m known as the Texas farmgirl around the office, I’ve often said it’s because I live a decidely non-tech life that I can excel at a high-tech work life. Which brings me back to this week. My emotions have been all over the map with these changes. But I am reminded once again just why the farm life is the perfect spot for us. Horse stall therapy! You see, when you are up to your elbows in documentation and timelines and everything feels critical, a horse (or any animal) can be a calming friend and a reminder to take a breath. And around the farm, it’s not just Ranger who can fill up your soul. It’s watching Nightmare the cat criss-cross the horse stalls by being mister twinkle toes across the fence tops. It’s watching Maybelle the dog’s ear flop with joy as she runs across the yard in sheer joy as she chases a rock. (Yes, I said rock.) It’s listening to the brays of Sweetie Pie the donkey as she insists she is starving and will simply collapse if you don’t feed her one more time or give her some good neck rubs. Nightmare says perching is the best way to get a good view and avoid horse hooves. Maybelle is always good for a laugh. The dog is just so darn happy and relaxed. And sometimes you just need to work out with some good old fashioned farm work. Shoveling out horse stalls is about as honest as it gets. It is what it is, and with each scoop you put a little of your own muck in the bucket. It’s a farmtastic life for me, and while things may ebb and flow, and times can be upsetting or scary, it reminds me why Cowboy and I chose to move to the country and live this life. Horse stall therapy really is good for the soul. We’ve been pretty blessed on the farm, and all of our animals are getting along really well. We like to think it comes from a lot of love from us and absolutely wonderful vets, both equine and small animal. On occasion, things go off course and someone gets hurt or injured, and of course when this happens it’s always at odd times. What do I mean by odd times? Night, weekends, and holidays – when the price and the panic level both rise! The latest adventure belongs to Ranger. It was once said that Ranger should have been named Dennis the Menace because he simply can’t keep himself out of trouble. It’s not that he’s looking for trouble or mean in any way, his imagination just always gets the best of him. Oh, one minor detail I forgot to mention, this was right after the great ice storm in Texas this past December, which then turned into a mud-pocalypse in our pasture. Cowboy dutifully climbed on the big red tractor and pulled out our horse trailer. (Oh how I love tractors, but more on that another day.) We load Ranger, lock up the farm and head to the vet. Long story short, stitches are required, as are drugs. This is the first time in Ranger’s life he’s been sedated, at which point we learned not only is he goofy when drugged, but he is STUBBORN. It was great fun getting his groggy hind end back in the trailer for the ride home. Picture us out in the parking lot, me and the vet pushing on his rump and Cowboy pulling on his front. Oh what a sight we were! After some great veterinary care, Ranger is all sewn up and sent home with meds. And just look at him now … amazing mane blowing in the wind, stitches out, and fur slowly growing back. I just love this guy! Back to the farm we went, supplied with medicines and thankful hearts. Ranger just missed his eye, so we were definitely counting our blessings. Two weeks later, stitches came out and Ranger is on the mend. The great news is that it looks like there won’t be a scar on his handsome face (because as you know he is my Fabio). Big thanks to our wonderful vets who always fit us in, night or day or holiday. We couldn’t live this farmtastic life without you! P.S. – We found how Ranger injured himself. It was a rogue screw high up on a piece of equipment. It was an absolute fluke that he found it, but it has been fixed. Thanks to Cowboy of course, who was up at dawn the next day hunting the source of the injury. They may be “my” horses, but I know how he really feels about them. It’s that time of year when gyms fill with hopeful new members, weight loss commercials jam the air waves, and we all resolve to strive to be better versions of ourselves in the coming year. Which of course got me thinking about life around the farm, and just exactly what would the animals resolve for 2014 (or rather what would I wish that they would resolve to do). So to get the year started off right, here’s a few words from the critters here on the farm. Ranger – Everyone knows that I’m the looker on the farm, so I resolve to get my gorgeous mane in fewer knots. Mom loves to brush me, but I don’t enjoy the talking to that I get when I’m a mess. Sweet Suzy Q – I love to eat, in fact it’s my favorite thing, but sometimes I get a wee bit pushy when it comes to dinner time, banging gates and what not. I resolve to take it easy on the gates and other things that I find to make noise, as I know my mom and dad always keep me in great grain and hay. Smokey – Well I’m often full of hot air just blowing at everything new that comes my way, so I resolve to tone it down a bit. I mean my mom and dad know that I’m really just blowing smoke (ha ha)! River – I’ve really come to love my humans, so I resolve to continue to build up my confidence. Oh, and to take my wormer much easier. Dad really doesn’t love being covered in wormer paste. Mama Rose – I resolve to finally let my humans pet me. I mean it’s been four years and they spoil us so much, it’s really the least I could do. Sweetie Pie – I resolve not to chase or bite my humans’ cars (or their family members’ cars). While they are quite yummy, I truly do prefer some fresh hay. Goober – I resolve to get a grip when Cowboy asks me to go outside. It is very silly that I act like my legs are totally new and go slipping and sliding out the front door. And Cowboy has been nothing but nice to me, so I suppose I could give him a break. Dixie Doodlebug – I resolve to eat a little less and walk a little more. I mean in my younger days I was a tennis ball chasing fool, but no one is fully buying that it’s just my thyroid. 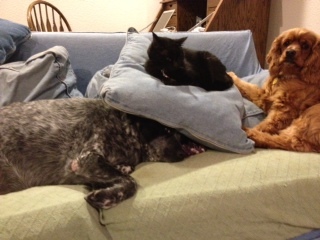 Abby – I resolve to try to cut down on the shedding. While I do love leaving my signature white puffs floating all around, my mom would love it if we could make a vacuum cleaner bag last more than a week. Maybelle – Well I am just so darn cute, I don’t really know why I need to resolve to do anything differently other than just being my sweet adorable self. My mom may disagree, but I’m sticking to it. Rhinoceros – I resolve to torment the dogs a little less, although I do love watching over their water bowl as they salivate and wish I would move. Willie – I resolve to be more patient with Maybelle. I’m doing my best to school her into being a proper pup, but she is just so enthusiastic it wears my old bones out. Shadow, Bear, Grizzly, and Chip – Since we’re a little family within the farm family, we decided on a family resolution, which is that we will not run around like crazy cats at night when it is time to go to bed. It really does wear our humans out and we are truly grateful that they took us in. Nightmare – Since I’m the true barn cat around here, I resolve to continue to prowl the barn, but when I find great prizes, e.g. mice, I won’t always display them quite so proudly, as it really freaks out my mom. And as the human that belongs to all of these wonderful critters, I resolve to keep up with our blog much better so that they can share all of their antics with you. Best wishes and blessings for 2014 – from our farmtastic life to yours! This is what Dixie thinks about resolutions, just hide them under the cat. Maybelle of course, being adorable.